Hepatitis C kills more than 20,000 Americans each year, more than the other 60 deadly infectious diseases combined. Most hepatitis deaths occur among adults in their prime working years– ages 45 to 64–compounding the already devastating social toll of the disease. The good news is that hepatitis C is now curable with just three months of one of a few new and easily-tolerable treatments. With a cure in hand, the prospect of eliminating the scourge of hepatitis C is real. Recognizing this issue, the Centers for Disease Control, the nation’s health protection agency, requested the National Academies of Sciences, Engineering, and Medicine to convene a committee of experts to develop a national strategy for the elimination hepatitis C as a public health problem. The National Academies report concluded that treating all hepatitis C patients could avert near 30,000 deaths and reduce incidence of hepatitis C 90% by 2030. To meet this goal, the committee advocated treating everyone with the new treatment regimen, without regard to their disease stage. However, the report acknowledged that treatment can cost tens of thousands of dollars for each patient, making it unaffordable for most patients and public and private insurers. The problem is most acute for the most vulnerable populations. 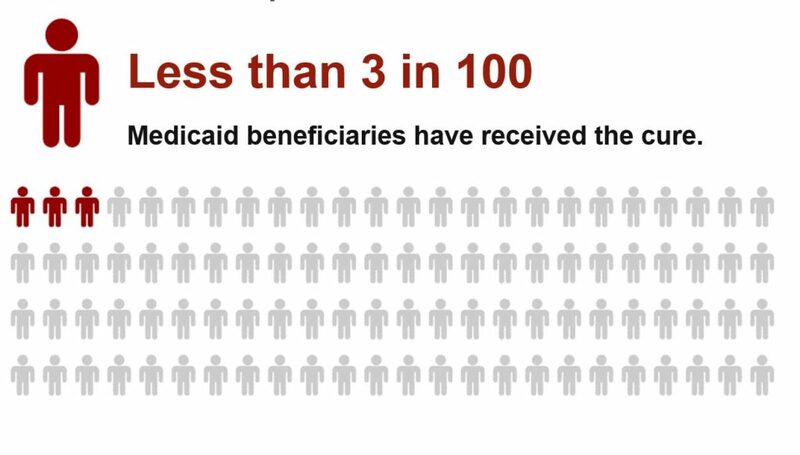 There are roughly 700,000 people in state Medicaid programs and prisons who are eligible for treatment, but only about 20,000 (less than 3%) will receive treatment each year. [2,3,4 ] This is due partly to the restrictions imposed by many states on accessing the drug, including requirements that (contrary to National Academies report) require Medicaid beneficiaries to have a certain state of fibrosis (liver disease), restrictions on who may prescribe the hepatitis C treatment, or bans on patients with histories of alcohol or substance use. These restrictions are not justified by clinical guidelines; states impose these restrictions primarily to limit the impact on their budgets. The high prices of these new medicines exist mainly because the federal government grants drug manufacturers a period of market exclusivity through the issuance of patents. One option for reducing prices and improving access is for the federal government to take back the patent protection afforded to manufacturers of hepatitis C cures, thereby enabling production of generic versions of the drugs. Such a move, however, is both undesirable and unlikely because it would have a chilling effect on innovation, meaning fewer cures in the future. This raises the policy dilemma: How can we improve access to hepatitis treatment without jeopardizing future cures? The National Academies report offers a way out of this policy dilemma. It recommends a voluntary transaction between the federal government and a pharmaceutical company, wherein firms producing hepatitis C treatments compete to license their patents to the federal government for use in low-income, vulnerable patient populations, such as those served by Medicaid. Once the federal government purchases the rights to a patent, generic manufacturers may produce the drug for supply to Medicaid and prisons. Since the publication of the National Academies report there has been limited interest at the federal level in brokering this deal on behalf of Medicaid programs. However, some states have expressed interest in increasing access to pharmaceuticals without increasing Medicaid budgets. A recent paper published by the authors of this report in the Annals of Internal Medicine proposes a novel strategy for increasing access to hepatitis C treatments in the Medicaid program. This novel state-level strategy is inspired by the National Academies recommendation; just like the National Academies recommendation it increases access to treatment by proposing a novel contracting strategy. The National Academies recommendation relies on licensing patents; the strategy proposed in the Annals of Internal Medicine paper avoids this complication by contracting with a patent holder to obtain the drug for a defined population. The National Academies recommendation targeted federal policymakers with a federal-level solution, but the novel strategy targets state policymakers, allowing each state to negotiate on behalf of its Medicaid beneficiaries. In this policy brief, we describe the novel state-level strategy in greater detail. We discuss its implications for different stakeholders–states, Medicaid beneficiaries, and pharmaceutical firms–and discuss legal challenges in implementing this novel strategy and ways to address them. Neeraj Sood is a scientific advisor for Precision Health Economics. Diane Ung and Anil Shankar are partners of the law firm Foley & Lardner, LLP. The authors did not receive financial support from any firm or person for this article or from any firm or person with a financial or political interest in this article. They are currently not an officer, director, or board member of any organization with an interest in this article. 1 Ly KN, Hughes EM, Jiles RB, Holmberg SD. Rising Mortality Associated With Hepatitis C Virus In The United States, 2003–2013. Clinical Infectious Diseases. 2016; 62(10:1287-1288. 2 National Academies of Sciences, Engineering, and Medicine. A National Strategy for the Elimination of Hepatitis B and C: Phase Two Report. Published March 28, 2017. National Academies Press, Washington, DC. 3 Senate Committee on Finance. The Price Of Sovaldi And Its Impact On The US Health Care System. (97-329 PDF/S. Prt. 114-20). Published December 2015. Washington, DC: Government Publishing Office. 4 Beckman AL, Bilinski A, Boyko R, Camp GM, Wall AT, Lim JK, Wang EA, Bruce RD, Gonsalves GS. New Hepatitis C Drugs Are Very Costly And Unavailable To Many State Prisoners. Health Affairs. 2016;35(10): 1893-1901. 5 Chung T, Davis GL, Jensen DM, Masur H, Saag MS, Thomas DL, Aronsohn EI, et al. Hepatitis C Guidance: AASLD-IDSA Recommendations for Testing, Managing, and Treating Adults Infected with Hepatitis C Virus. Hepatology. 2015;62(3):932-954. 6 Barua S, Greenwald R, Grebely J, Dore GJ, Swan T, Taylor LE. Restrictions for Medicaid Reimbursement of Sofosbuvir for the Treatment of Hepatitis C Virus Infection in the United States. Annals of Internal Medicine2015;163(3):215-223. 7 Sood N, Ung D, Shankar A, Strom BL. A novel strategy for increasing access to treatment for hepatitis C virus infection for Medicaid beneficiaries. Ann Intern Med. 2018. [Epub ahead of print]. doi:10.7326/M18-0168.